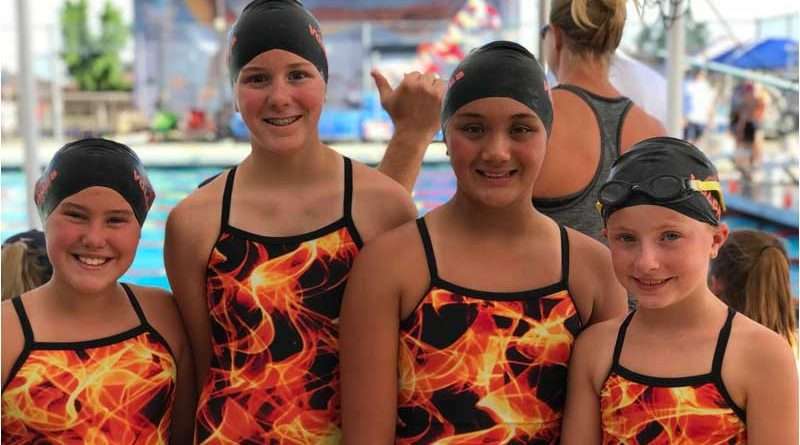 The Lassen Aquatics Swim Team, newly named Lassen Volcanoes, traveled to their first swim meet from June 15 to June 17 in Anderson, California. Twenty-two swimmers competed in events of distances between 25-500 yards. Swimmers participated in individual races in freestyle, breaststroke, backstroke and butterfly, as well as relay races made up of teams of four swimmers. For the boys’ 8 and younger division, Jeffrey Clingensmith finished the 50-meter freestyle with a time of 48.99 seconds. He finished the 100-meter freestyle with a time of 1:37.85. For the 25-meter backstroke, Clingensmith finished with a time of 25.28 seconds. In the girls’ 10 and younger division, McKennah Baker finished the 100-meter freestyle with a time of 1:38.26 and the 50-meter breaststroke with a time of 1:08.70. Brooklyn Eldridge finished the 50-meter freestyle with a time of 47.22. She then finished the 100-meter breaststroke with a time of 2:37.89 and the 100-meter individual medley with a time of 2:05.28. McKenzie Hilburn finished the 50-meter freestyle with a time of 47.40 seconds and then finished the 50-meter backstroke with a time of 55.25 seconds. Reagan Shrum competed in four events. For the 50-meter freestyle, she finished with 39.91 seconds on the clock. For the 100-meter freestyle, her time was 1:27.02. In the 50-meter backstroke, she finished with 48.63 seconds on the clock. For the 100-meter backstroke, Shrum finished with a time of 1:47.62. In the girls’ 11- through 12-year-old division, Claire Buehler took on the 50-meter and the 100-meter freestyle, the 50-meter and the 100-meter backstroke, the 50-meter breaststroke, the 50-meter butterfly and the 100-meter individual medley. Her times were 35.93 seconds, 1:19.93, 44.05 seconds, 1:36.31, 52.72 seconds, 45.83 seconds and 1:31.06, respectively. Hazel Gaumont finished the 50-meter freestyle with a time of 43.37 seconds, the 100-meter freestyle with a time of 1:45.61, the 50-meter backstroke with a time of 55.02 seconds and the 100-meter backstroke with a time of 2:00.64. Bailey Krier competed in the 50-meter backstroke and finished with a time of 1:14.15. Evelyn Lott finished the 50-meter freestyle with 40.81 seconds on the clock, the 100-meter backstroke with a time of 2:03.97 and the 100-meter individual medley with a time of 1:53.85. Emma Luna competed in the 50-meter and the 100-meter freestyle, the 50-meter backstroke, the 50-meter breaststroke, the 50-meter butterfly and the 100-meter individual medley. Her finishing times for the aforementioned events are 43.09 seconds, 1:34.28, 53.19 seconds, 1:01.40, 56.50 seconds and 1:50.08, respectively. Shelby Talley finished the 50-meter butterfly with a time of 54.15 seconds. In the boys’ 11- through 12-year-old division, Caden Eldridge competed in the 50-meter freestyle and the 100-meter breaststroke with finishing times of 46.22 seconds and 2:42.23, respectively. Jeremiah Shrum finished the 50-meter freestyle with at time of 38.97 seconds, the 100-meter freestyle with a time of 1:26.27, the 50-meter breaststroke with a time of 51.91 seconds, the 100-meter breaststroke with a time of 1:52.48 and the 50-meter butterfly with at time of 1:00.66. In the girls’ 13- through 14-year-old division, Kailey Hancock finished the 50-meter freestyle with a time of 37.41 seconds, the 100-meter backstroke with a time of 1:38.94 and the 100-meter breaststroke with a time of 1:43.02. Elizabeth Nielsen competed in the 50-meter freestyle and finished with 47.38 seconds on the clock. Emmalee Rotlisberger finished the 50-meter freestyle with a time of 34.79 seconds, the 100-meter backstroke with a time of 1:28.95 and the 100-meter breaststroke with a time of 1:41.10. In the boys’ 13- through 14-year-old division, Jon Buehler finished the 50-meter freestyle with a time of 33.39 seconds and the 100-meter freestyle with a time of 1:18.73. Jeremy Nielsen completed the 50-meter freestyle with a time of 45.33 seconds and the 100-meter backstroke with a time of 2:01.72. In the girls’ 15- though 16-year-old division, Lily Buehler finished the 50-meter freestyle with a time of 31.57 seconds, the 100-meter freestyle with a time of 1:16.14 and the 100-meter backstroke with a time of 1:33.23. In the boys’ 15- though 16-year-old division, Isaac Lott competed in the 50-meter and the 500-meter freestyle. In the former, he finished with a time of 30.74 seconds and in the latter, he finished with 7:22.96 on the clock. Colby Talley finished the 50-meter freestyle with a time of 38.02 seconds and the 100-meter freestyle with a time of 1:30.36. Coaches Camille Buehler, Rob Gaumont and Tina Hilburn said the young athletes really came together as a team and demonstrated good sportsmanship. 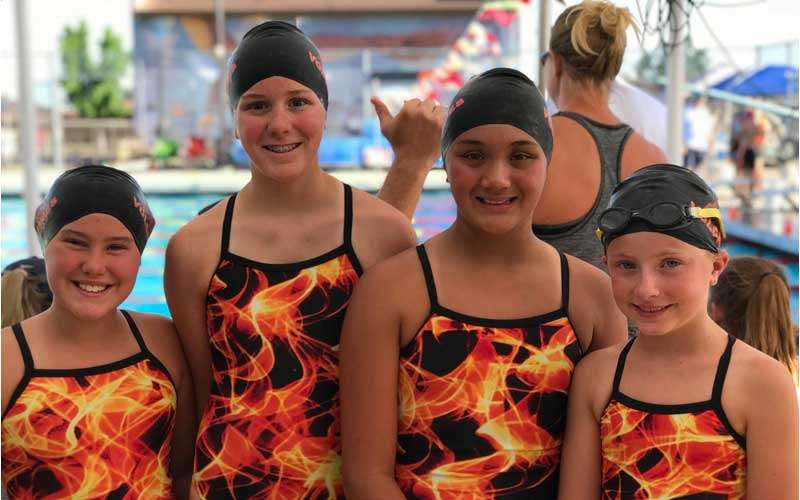 The Volcanoes traveled to Gridley for a meet between Friday, June 29 and Sunday, July 1. As the swimmers continue practicing and competing, coaches are looking forward to watching the swimmers improve their times.